Some of the top researchers in artificial intelligence received a special surprise from NVIDIA at the Computer Vision and Pattern Recognition conference in Salt Lake City, Utah yesterday. 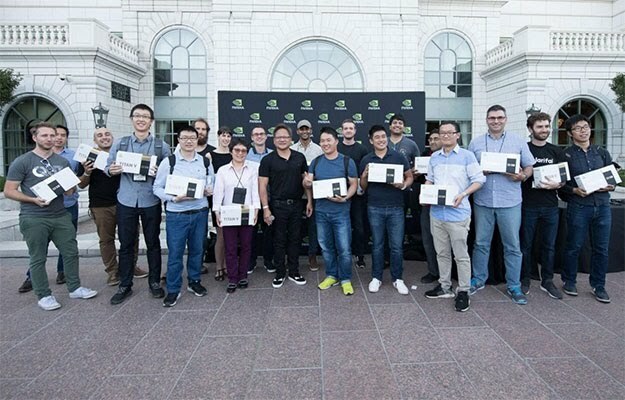 NVIDIA CEO Jensen Huang presented twenty randomly selected attendees with a limited edition Titan V CEO Edition graphics card, which isn’t just unique because the box bears Jensen’s signature, but also for the beefed up specs. Like the regular Titan V, the limited run CEO Edition is based on NVIDIA’s Volta architecture. However, it comes with 32GB of HBM2 memory and 6MB of L2 cache, up from 12GB and 4.5MB, respectively, on the vanilla Titan V.
It’s not clear if the Titan V CEO Edition also got a bump in Tensor Cores, which can offer massive improvements in deep learning workloads, or sticks with the 640 that are found in the regular Titan V. Either way, NVIDIA claims the Titan V CEO Edition can crank through deep learning matrix operations at 125 teraflops at FP15 precision, versus the Titan V’s 110 teraflops threshold. NVIDIA has not announced the Titan V CEO Edition as a retail part in limited quantities, and it’s not clear if the company plans to do that, or will use them in future promotions. It’s important to note, though, that the special edition card is not merely a Titan V with much larger memory stack—the card is a higher performing variant that puts it closer to NVIDIA’s Tesla V100 accelerator. How the rest of the specs match up is not yet known, but this is a monster Volta part no matter how you slice it.